A Morpeth business that is all about e-bikes is going from strength to strength. Ian Simpson teamed up with Peter Bredael to launch the Morpeth Electric Bicycle Company in 2017 above the Sims Cycle Workshop in Greys Yard, off Oldgate. The brands of the power-assisted vehicles on offer include Raleigh, Lapierre and Haibike. The duo are expanding their showroom and range to meet demand, saying they have benefited from a shift in perceptions on what an e-bike is among many people in the UK over the last 12 months. As a result, they are having a ‘re-launch opening’ at the premises on Saturday, February 2 from 10.30am. Refreshments will be available and Morpeth Mayor Jack Gebhard will be among the guests attending the event. The pricing of the bikes is set according to the battery size – 300 watts gives a range of 70 miles, 400 watts gives 112 miles and 500 gives 136 miles. There is a range of up to 100 miles on a single charge. Peter said: “e-bikes are a great way to save the planet and get fit in the process. “Customers are visiting us for many reasons, such as commuting solutions, fitness, allowing a partner to keep up with a cycle enthusiast and general freedom that in many cases has taken a car off the road. “So how do they work? Well, you still pedal – there’s no just sitting there – but the amount of pressure on the pedals is amplified by up to 300 per cent, so you travel further and faster for the same effort as you would on a normal bicycle. “When you reach a hill, instead of slowing down the motor kicks in to give you a boost that makes it feel as if the hill is not there. 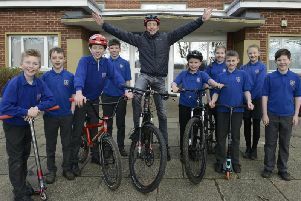 “Similar to the cycle to work scheme, which is capped at £1,000, the Green Commute Initiative has been set-up to accommodate the growing rise in e-bikes. For more information about the bikes, and to arrange an accompanied test ride, call the Morpeth Electric Bicycle Company on 01670 238295.